I found this book quite by accident as I was surfing Amazon.com. I found it fascinating and thought-provoking. We all have social biases. 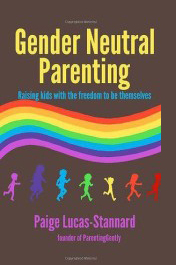 Gender Neutral Parenting: Raising kids with the freedom to be themselves by Paige Lucas-Stannard. For example, a Yale study published in 2012 re an applicant for a lab manager position found differences in assessment based on the gender of the applicant. Half the scientists were given the application with a male name attached and half were given the exact same application with a female name attached. The application with the female name lagged behind the one with the male name on competence, hireability, and desire to serve as mentors and the one with the female name was offered $4000 less in salary. “Our culture has strict rules for acceptable behavior for men and women. But what about kids who fall outside the boundaries of prescribed roles? This book is a guide for parents in the practical application of Gender Neutral Parenting – a parenting style based on respect for a child’s self-identity and providing latitude in exploring their own version of gender and gender expressions…. “You’ll learn about gender stereotypes for boys and girls and how to counteract them as a parent…. “You’ll also learn how to deal with family and friends (and strangers) that don’t understand your parenting approach.